Animal Equality once again reveals the terrifying reality of industrial slaughterhouses thanks to a new investigation conducted inside a factory for the slaughter of rabbits located in Lombardy. 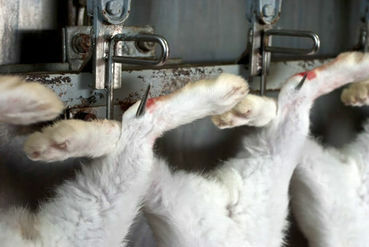 The raw images, obtained thanks to the work under cover of an investigator, show the systematic violence to which rabbits bred for meat in Italy are subjected every day. PLEASE TAKE ACTION! - Thank you so much!! Noted and signed. Too appalling for words, thank you for posting Pablo. Noted and signed. Shocking cruelty to such intelligent and sensitive creatures. #4783 signatures needed to reach goal of 150000 ~ PLEASE SIGN! But be careful: you can still do a lot! " " 145,330 people have already signed "
145.347 persone hanno già firmato.